An accomplished opera performer tackles his most rewarding role yet: teacher. His first week teaching full time at BYU, opera baritone and associate music professor Darrell G. Babidge (MM ’99) worried he might feel claustrophobic. As a performer, his voice had taken him to the Metropolitan Opera, Carnegie Hall, and other renowned stages. He and his wife, Jennifer, also an acclaimed opera soloist, had never lived anywhere for more than two years. The idea of leaving behind his opera career to settle in one place and teach had left him uncertain. But in a faculty meeting that first week, his new college dean brought an old photo of former music faculty members standing in front of the Maeser Building. “There was something about that small group of steadfast musicians that inspired me,” he says. Overcome, Babidge remained quiet in the meeting. But when he returned to his office, he made a copy of the old faculty photo, framed it, and put it on a nearby bookshelf. And reflecting on the artists President Kimball mentioned in his address, he had an epiphany. “Two of them received their training from mentors,” Babidge explains. “And at that moment, I realized I could make a real musical contribution to [my] students.” Even today, Babidge cannot discuss the prophet’s charge without becoming emotional. 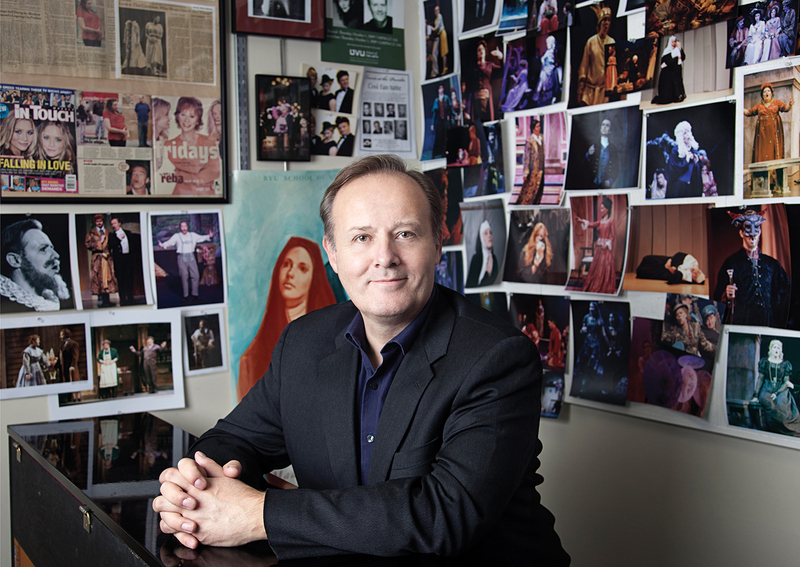 Darrell Babidge’s office walls, packed with photos and memorabilia, offer glimpses into both his own opera performances and those of his students. Photo by Nathalie Van Empel. 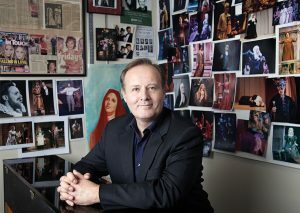 Committed to his new role as mentor, he settled in, hanging family photos and opera memorabilia on his office walls. And in the last seven years, his own mementos have been joined by images of his students, many of whom are already finding professional success in opera. Except for a bank of windows that lets light spill into his office, the walls are jammed. Among his protégés are Rachel Willis-Sørensen (BM ’08, MM ’09) and Rebecca A. Pedersen (’15), both of whom won the rigorous Metropolitan Opera’s National Council Auditions. And baritone Shea M. Owens (BM ’10), who has performed with multiple opera companies over the past few years, credits Babidge with helping make his career possible. Watching Babidge teach a master class provides a glimpse into both his musical passion and his mentoring style. When a student does something he especially likes, his voice rises instinctively as he shouts, “Yes, yes. You’ve got it!” or “That is absolutely perfect!” Other times he demonstrates his approval by slapping his hand on the desk. And the violin professor whose office is directly above Babidge’s often jokingly teases him about his yelling. Regardless of his methods, Babidge is fully invested in his latest role. And for that role, he received the Young Scholar Award at BYU’s 2014 Annual University Conference. “I am not a scholar by any means,” he acknowledges, but says he received the award because of the way he mentors. 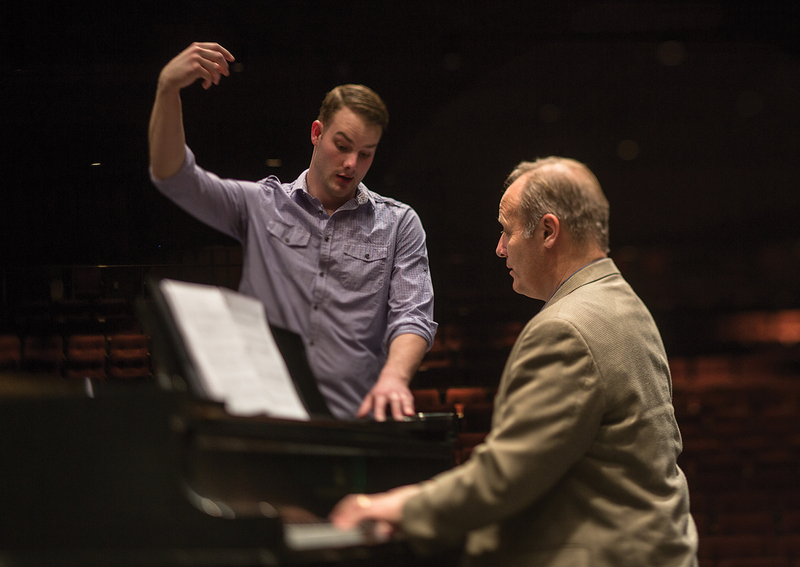 Vocal performance major Tyrell M. Wilde (’17) says Babidge is “very patient” when he teaches and describes his mentoring style as uniquely intuitive: “If I’m having a hard time with a certain vowel or a note, he’ll have this idea pop into his head—it’s almost bizarre—and it will help me get over the hurdle.” Photo by Bradley Slade. Willis-Sørensen, who now lives in Germany, practices with Babidge via Skype or FaceTime before her concerts and details the personal nature of his teaching. In addition to keeping up with former students through online lessons, Babidge makes it a point, whenever possible, to applaud from the audience when they land major opera roles, whether their performances are stateside or abroad. But after he and Jennifer left New York City and moved to Utah to raise their kids—“We figured we could fly anywhere for our careers,” he says—BYU made an offer. Despite his initial hesitation to accept the position, it was clear even from that first week that his decision was the right one.